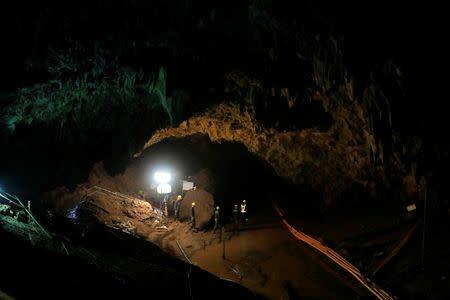 BANGKOK (Reuters) - Twelve boys and their soccer coach rescued from a flooded cave in Thailand planned to explore the cavern complex for only about an hour before treacherous flood waters rose to trap them for more than two weeks, one of the boys' fathers said. "He told me that as soon as they finished practice they went to play at the cave. They thought they'd only be an hour," Banpot Korncam, father of the 13-year-old captain of the "Wild Boars" team, told media. "While they were inside the cave it rained, water flowed in and everyone took off," Banpot said. "They just sat quietly without doing anything because it was dark," said Banpot, recounting what his son, who is still in hospital, had told him. "When they were hungry Coach Ek would use a flashlight to shine on the stalactites above," he said. "The boys' health is improving ... relatives can now visit them in close proximity," said Thongchai Lertwilairatanapong, a health ministry inspector. "We're not heroes," he told the BBC after arriving back in London. "What we do is very calculating. It's very calm, it's quite the opposite ... But it's really the international team I would like to focus on and the Thai SEALs." "How many of you?" he asked, a torch beam scanning the boys crowded on the bank. Prime Minister Prayuth Chan-ocha said on Thursday international members of the rescue team would be given a "Thailand Elite" card worth 500,000 baht ($15,000) with benefits including a 5-year visa in thanks.